Leaders from the European Union and Japan signed a landmark trade deal on July 17, creating one of the world’s largest open trade zones including more than 600 million people and about a third of global GDP. 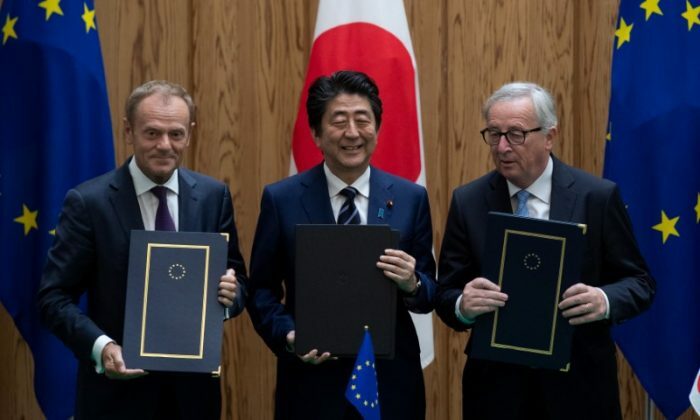 At the EU–Japan summit in Tokyo, presidents Jean-Claude Juncker and Donald Tusk and Japanese Prime Minister Shinzo Abe signed the EU–Japan Economic Partnership Agreement, the biggest trade deal ever negotiated by the European Union. Juncker, who has served as President of the European Commission since 2014, hailed the deal as not just a tool to boost the European and Japanese economies, but a renewed commitment to cooperative trade arrangements. The EU-Japan agreement will remove the vast majority of the 1 billion euros ($1.2 billion) in duties paid annually by EU companies exporting to Japan. The deal also drops a number of long-standing regulatory barriers and will also open up the Japanese market of 127 million consumers to key EU agricultural exports. “The economic benefits of this agreement are clear. By removing billions of euros of duties, simplifying customs procedures, and tackling behind-the-border barriers to trade, it will offer opportunities for companies on both sides to boost their exports and expand their business,” said Cecilia Malmström, Europe’s Commissioner for Trade. “The European agriculture sector, in particular, has something to celebrate, with access to the enormous Japanese market and protection for over 200 distinctive food and drinks like Champagne and Parma ham,” she said, according to an EU press release. The deal removes EU tariffs of 10 percent on Japanese cars and 3 percent on most car parts. It would also scrap Japanese duties of some 30 percent or more on EU cheese and 15 percent on wines, and secure access to large public tenders in Japan. Japanese car and car parts makers are also expected to increase their sales to Europe, where they have lagged behind European rivals. However, Japan’s dairy industry is expected to lose market share to European products once tariffs of up to 40 percent on some cheese imports start coming down. The United States this month imposed 25 percent tariffs on $34 billion of Chinese goods in response to China’s persistent trade violations that include hundreds of billions of dollars per year of intellectual property theft from US companies. China responded with retaliatory tariffs, prompting the U.S. administration to propose on July 16 an additional 10 percent levy on $200 billion worth of Chinese exports. In a statement last Friday, U.S. Trade Representative Robert Lighthizer supported President Donald Trump’s decision to take further economic action against China. “The initial tariffs that the President asked us to put in place were proportionate and responsive to forced technology transfer and intellectual property theft by the Chinese. It is very unfortunate that instead of eliminating these unfair trading practices China said that it intends to impose unjustified tariffs targeting U.S. workers, farmers, ranchers, and businesses,” Lighthizer said. 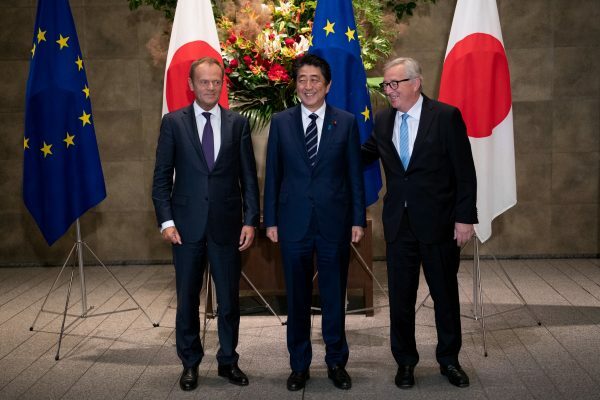 The details of the deal between Japan and the EU were hammered out over the course of four years, and finalized in late 2017. In complement to the Economic Partnership Agreement, the EU and Japan concluded negotiations on July 16 on reciprocal adequacy regarding data. They agreed to recognize each other’s data protection systems as “equivalent.” This would allow data to flow safely between the EU and Japan and create the world’s largest area of safe data flows, according to a press release. The total trade volume of goods and services between the EU and Japan is €86 billion. “We are sending a clear message that we stand against protectionism. The EU and Japan remain open for cooperation,” European Council President Donald Tusk, who speaks for the 28 EU national leaders, told reporters. The agreement now awaits ratification by the European Parliament and the Japanese Diet. It could then enter into force in 2019.